Yadav Tours and Travels have earned the status of the fastest growing Travel Management Companies in the country. We have made sure that we have everything related to meet the varied demands of our clients. We have emerged as one stop shop policy designing vacations that will take you to different parts of the country. Our excellent services comprise of Car & Coach Rental services. Our cars comprises of Compact, Convertible, Economy, Luxury, Premium, Standard, Mini Van, Compact Pick Up and MUVs & SUVs. We also offer Wedding Car Rental Services to our clients. We have a team who comprises of highly experienced individuals whose efforts have given us a unique standing in the market. Our extensive knowledge of the industry has led us to deliver exclusive services of our clients. 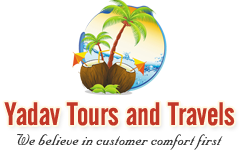 Yadav Tours and Travels was founded in the year 1986 under the expert supervision of Mr. S.S.YADAV. Based in Delhi, we organize domestic tours for our clients. We render our services for car hiring and car rental for Delhi. We have given great work because of our strong will to make a difference to the tourism sector. The happiness we render to our client has a lot to do with the type of experience people are having. We render our services in India. Give us a call to know more about our services.